NSF's vision of a Cyberinfrastructure Framework for 21st Century Science and Engineering (CIF21) identifies advancing new computational infrastructure as a priority for driving innovation in science and engineering. Innovation occurs through advances in computing facilities, scientific instruments, software environments, advanced networks, data storage capabilities, and the critically important human capital and expertise. Software is thus an integral enabler of computation, experiment and theory and a central component of the new computational infrastructure. Scientific discovery and innovation are advancing along fundamentally new pathways opened by the development of increasingly sophisticated software. Software is also directly responsible for increased scientific productivity and significant enhancement of researchers' capabilities. Capabilities: Support the creation and maintenance of an innovative, integrated, reliable, sustainable and accessible software ecosystem providing new capabilities that advance and accelerate scientific inquiry and application at unprecedented complexity and scale. Research: Support the foundational research necessary to continue to efficiently advance scientific software, responding to new technological, algorithmic, and scientific advances. Science: Enable transformative, interdisciplinary, collaborative, science and engineering research and education through the use of advanced software and services. Education: Empower the current and future diverse workforce of scientists and engineers equipped with essential skills to use and develop software. Further, ensure that the software and services are effectively used in both the research and education process realizing new opportunities for teaching and outreach. Policy: Transform practice through new policies for software addressing challenges of academic culture, open dissemination and use, reproducibility and trust of data/models/ simulation, curation and sustainability, and that address issues of governance, citation, stewardship, and attribution of software authorship. The collective goal of NSF's CIF21-related software programs is to transform innovations in research and education into sustained software resources that are an integral part of the cyberinfrastructure. This may involve long-term investments focused on catalyzing new thinking, paradigms, and practices in developing and using software to understand natural, human, and engineered systems. These programs address all aspects of cyberinfrastructure, from embedded sensor systems and instruments, to desktops and high-end data and computing systems, to major instruments and facilities. They will result in the development of sustainable software communities that transcend scientific and geographical boundaries. It is NSF's expectation that these investments will result in robust, reliable, usable and sustainable software infrastructure that is critical to the CIF21 vision and will transform science and engineering while contributing to the education of next generation researchers and creators of future cyberinfrastructure. Furthermore, the programs recognize that integrated education activities will play a key role in sustaining the cyberinfrastructure over time and in developing a workforce capable of fully realizing its potential in transforming science and engineering. 1. Software Elements target small groups that will create and deploy robust software elements for which there is a demonstrated need that will advance one or more significant areas of science and engineering. 2. Software Frameworks target larger, interdisciplinary teams organized around the development and application of elements of common software infrastructure aimed at solving common research problems. These awards will result in sustainable community software frameworks serving a diverse community. 3. Software Institutes focus on the establishment of long-term hubs of excellence in software infrastructure and technologies, including elements and frameworks, that will serve a research community of substantial size and disciplinary breadth. Projects at the Element, Framework, and Institute levels should be submitted to the SSE, SSI, or S2I2 classes, respectively, of SI2. The SI2 program is synergistic with the NSF programs and solicitations for computational and data-enabled science and engineering (CDS&E) (PD 12-8084). The main output of the SI2 program is sustainable software to support innovation in science and engineering. The SI2 program is also synergistic with the Data Infrastructure Building Blocks (DIBBs) program. The main output of an SI2 program is sustainable software to support innovation in science and engineering, while the main output of the DIBBs program is data systems. If a potential project seems to fit both of these programs, the PI should carefully consider what the core contribution of the project is, and submit to the more relevant program. Any questions should be addressed to the ACI program officers listed on both solicitations. Proposals appropriate to the CISE Core and Cross-Cutting programs should be sent to those programs. Proposals about cyberinfrastructure to support a CISE-centered research community may be appropriate for the CISE Research Infrastructure (CRI) (NSF 15-590) program. Proposals that use computer science and software engineering concepts, tools, methods, processes, etc. in support of multiple science/engineering disciplines to achieve the goals of SI2 are appropriate for submission to SI2 if they otherwise meet the objectives of the SI2 program. It is recommended that PIs contact the listed program directors to guide their proposals to the most appropriate programs. The Development track within the Advances in Biological Informatics (ABI) program (NSF 15-582) accepts proposals for the development of software tools at the element and framework levels. Projects that target a predominantly biological user audience should be directed to this program. BIO's participation in the SI2 program focuses primarily on activities at the SSI and S2I2 scale where the target audience includes a biological community, but is sufficiently relevant to other communities to justify multi-directorate co-funding. Other programs within BIO, such as NEON, Advancing Digitization of Biological Collections, and BIO's Centers program do not accept explicit software development proposals, but have active awards (such as the iPlant Collaborative) that include development of software that may be relevant for PIs to consider for potential synergies. Note that BIO does support research with disease-related goals or infrastructure where such research is the targeted audience. PIs are encouraged to consult with program officers about the appropriate fit for their proposed project. Discipline-specific projects at the Element level should be submitted to the SSE class of the SI2 program if the proposed project is to develop software for education research which will be used by a large community of education researchers. Projects at the Framework and Institute levels should be submitted to the SSI and S2I2 classes of SI2. Projects that focus on interdisciplinary research integrating computational methods, mathematical and statistical analysis, and/or high performance computing with engineering applications to advance discovery, design and operation of engineering problems should be submitted to the Computational and Data-enabled Science and Engineering Program (CDS&E) (PD 12-8084). Projects that focus on software development for an engineering discipline that will lead to a broad user base may be considered for the SSE element of the SI2 program. Projects at the framework and Institute levels should be submitted to the SSI and S2I2 classes, respectively, of SI2. In all cases, the engineering application and the open-access issues must be emphasized. Projects at the Element level may be submitted to SI2 or the appropriate program in the Directorate of Geosciences, including Geoinformatics Program in the Division of Earth Sciences (EAR) (NSF 11-581) and the Polar Cyberinfrastructure Program in Polar Programs. PIs should contact the program directors in the relevant divsions and programs to discuss possible projects. Projects that serve the Geoscience community at the Framework level should be submitted to the SSI class of SI2. For projects at the Institute level, PIs should engage in the EarthCube process (http://www.nsf.gov/geo/earthcube/). Engagement in the EarthCube community development process is highly encouraged. Information on current activities is available at http://earthcube.org. Discipline-specific projects at the Element level should be submitted to the SSE class of the SI2 program if the intent of the proposed project is to develop software that will be used by a broad user base with realistic potential for use outside the discipline. Such proposals should demonstrate how that use will be realized and assessed. Projects whose primary intent is to advance a specific science project should be submitted through the Computational and Data-enabled Science and Engineering Program (CDS&E) (PD 12-8084). Projects at the Framework and Institute levels that address fundamental MPS research areas should be submitted to the SSI and S2I2 classes, respectively, of SI2. Discipline-specific projects at the Element level should be submitted to the SSE class of the SI2 program if the intent of the proposed project is to develop software that will be used by a broad user base with realistic potential for use outside the discipline. Projects at the Framework level should be submitted to the SSI classes of SI2. In all cases, SBE is particularly interested in multi-disciplinary projects that further the goals outlined in SBE 2020 (http://www.nsf.gov/sbe/sbe_2020/). 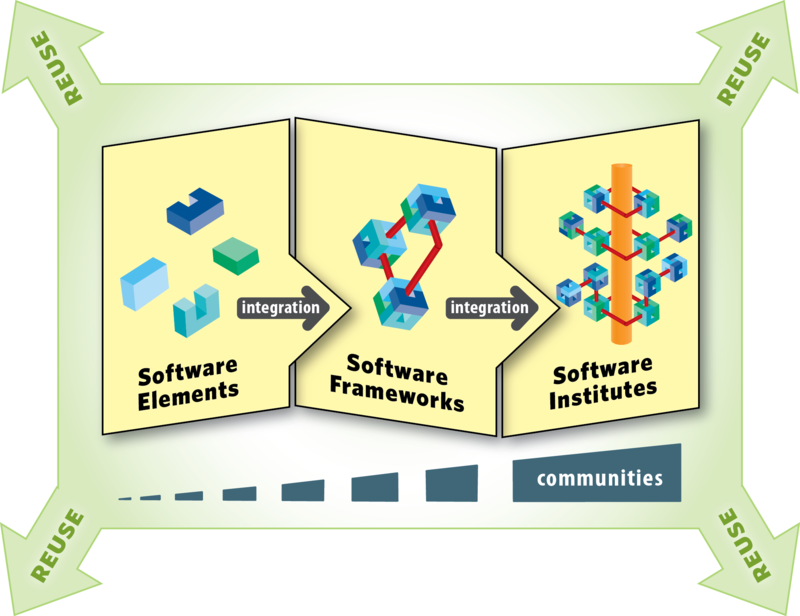 Software Infrastructure for Sustained Innovation (SI2) is a cross-foundation program, which is expected to generate and nurture the interdisciplinary processes required to support the entire software lifecycle, and will successfully integrate software development and support with innovation and research. SI2 envisions vibrant partnerships among academia, government laboratories and industry, including international entities, for the development and stewardship of a sustainable software infrastructure that can enhance productivity and accelerate innovation in science and engineering. SI2 projects should be conceived of and executed as part of the broad cyberinfrastructure context. 1. Scientific Software Elements (SSE): SSE awards are Software Elements. They target small groups that will create and deploy robust software elements for which there is a demonstrated need that will advance one or more significant areas of science and engineering. 2. Scientific Software Integration (SSI): SSI awards are Software Frameworks. They target larger, interdisciplinary teams organized around the development and application of common software infrastructure aimed at solving common research problems. SSI awards will result in sustainable community software frameworks serving a diverse community. 3. Scientific Software Innovation Institutes (S2I2): S2I2 awards are Software Institutes. They focus on the establishment of long-term hubs of excellence in software infrastructure and technologies that will serve a research community of substantial size and disciplinary breadth. 4. Reuse: In addition, SI2 provides support through a variety of mechanisms (including co-funding and supplements) to proposals from other programs that include, as an explicit outcome, reuse of software. Proposals that integrate with previously developed software, either by reference or inclusion, are encouraged. Proposals developing new software with an explicitly open design for reuse may also be considered. The purpose of the Reuse class is to stimulate connections within the broader software ecosystem. The class of reuse awards is currently being developed. Multidisciplinary projects at the SSE, SSI, and S2I2 levels should be submitted to the appropriate SI2 solicitation. It is strongly recommended that PIs who are thinking of submitting a software proposal that crosses disciplines contact the Program Officers in the programs whose communities would benefit from the software being proposed. They should seek guidance on disciplinary and programmatic priorities and to be sure that what is proposed will be well rooted in end-user needs and integrate or augment on-going investments in those disciplines. This will help to ensure that the proposals are as competitive as possible, that any redundancy of effort is minimized, and that the proposed effort leverages, as much as possible, previous NSF investments that serve the targeted communities.